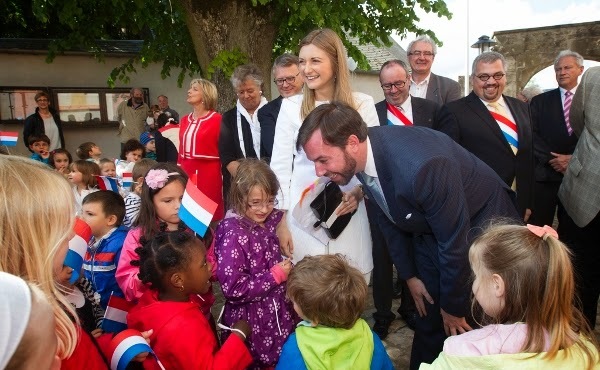 Today Hereditary Grand Duke Guillaume and Hereditary Grand Duchess Stéphanie continued their tour of the Grand Duchy's 15 Centre de Développement et d'Attraction (CDA) by paying a visit to the town of Junglinster. The couple stayed in the municipality in Luxembourg's east for about three hours. After being welcomed at the town hall, the Hereditary Grand Duke and the Hereditary Grand Duchess were given a presentation about the municipality Junglinster which consists of the towns and villages of Altlinster, Badweiler, Burglinster, Eisenborn, Eschweiler, Godbringen, Gonderingen, Graulinster, Imbringen, Junglinster itself as well as Rodenburg. The couple also visited the local recycling centre, an innovation centre as well as the parish church. 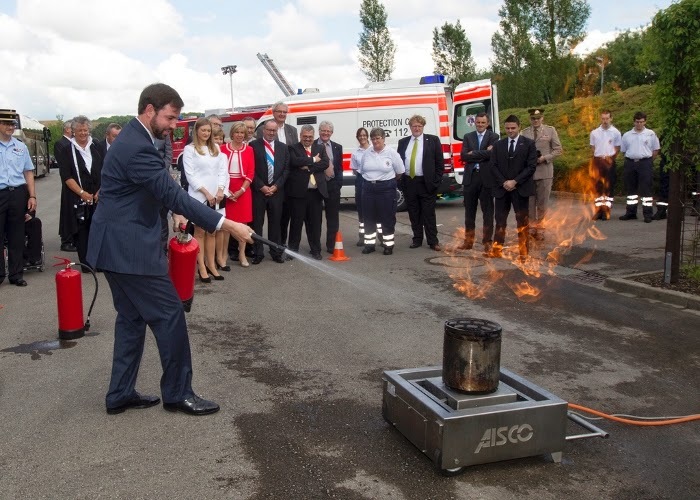 The Hereditary Grand Duke's highlight of the day probably was putting out a blaze, after all he wanted to be a firefighter when he was a child. After a walk through the park, Hereditary Grand Duke Guillaume and Hereditary Grand Duchess Stéphanie met with elderly people living in the local Centre Intégré pour Personnes Agées (CIPA), a home for older people who need more support due to health or social reasons than they can get in their own home. It is also the goal of the homes to avert social isolation and depression among the elderly. In interviews prior to her wedding Hereditary Grand Duchess Stéphanie expressed the wish to do work in this field. To round off the day, the Hereditary Grand Ducal Couple watched performances by local children and attended a reception hosted in their honour. The German version of Wort has a gallery of visuals of the visit to Junglinster, as does Wort in English and the cour grand-ducale.